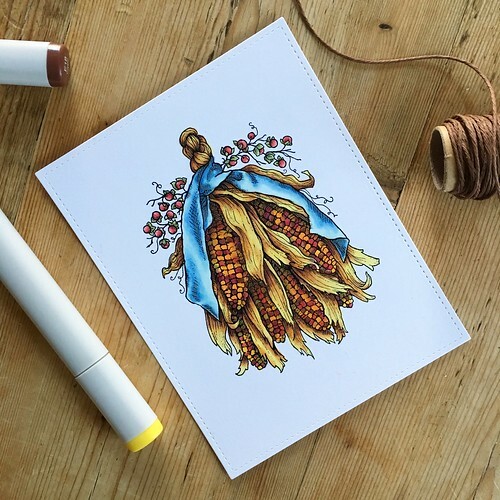 Popping in quickly today to share a card for week 3 as a Concord & 9th guest designer for the November release! 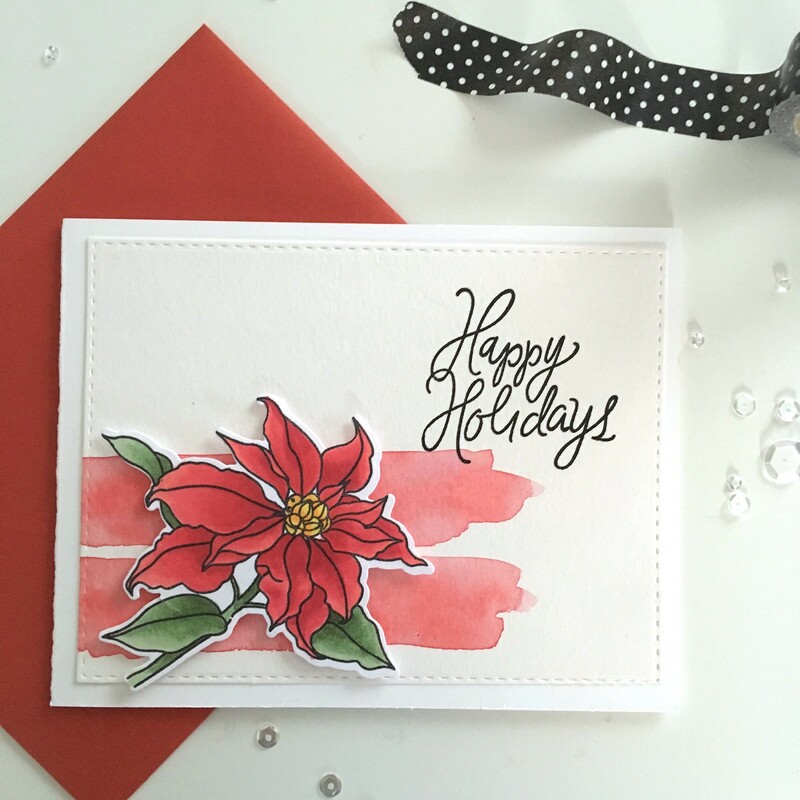 This week I used the Bundled Up stamp and die sets. I started the card by stamping the cute kids in the set on some scrap paper with Memento Tuxedo Black ink. 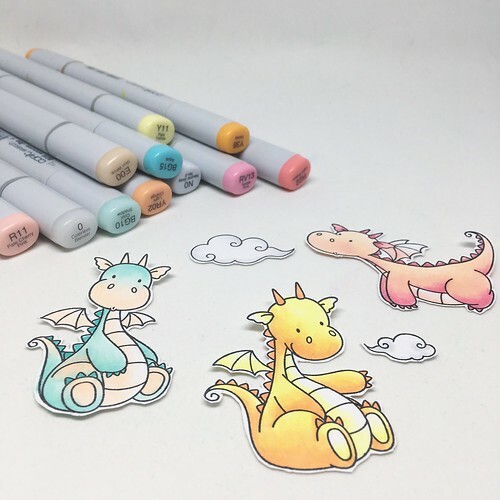 I then colored them with copic markers and die cut them with the coordinating dies. I then used circle dies to cut a few circles in a panel. I used the panel as a stencil for a backing that would go behind the panel, and then used distress inks to color the area that would be behind each circle. I stamped a sentiment from the Bundled Up stamp set on my backing and then situated my little kiddos the way I wanted them, popping them up on the backing with foam tape and letting them pop out of the circles on the panel a bit. After adhering the panel to the backing, I mounted everything onto a card base. I added a few sequins as a finishing touch! Hope everyone is enjoying this holiday time! Is anyone doing any Black Friday or Cyber Monday shopping this weekend? I’m hoping to pick up a few last minute things for the nursery! 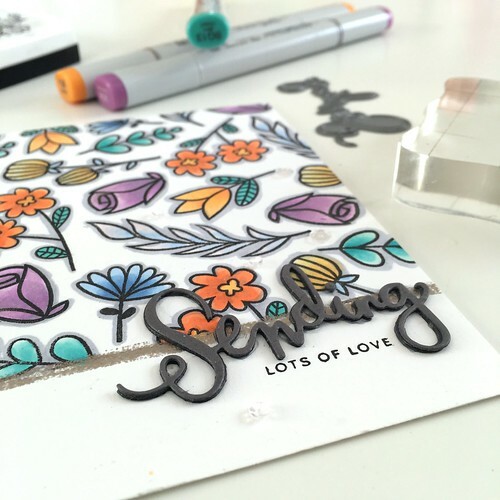 I started with an A2-sized card base and masked off about 1 and a half inches at the bottom, and then began stamping various floral images from the Altenew Hello Sunshine stamp set. I used SSS Intense Black Ink for this, because I knew I’d be coloring the images in with my Copic markers after I finished all the stamping. I colored everything with a combination of Copic colors and I really ended up loving the color scheme. I then outlined each image with a gray marker (N2) to make everything stand out a bit more. After that, I added a line of liquid platinum embossing powder across the bottom of the card to delineate the space between where the white space and the stamped part of the card met. For the sentiment, I die cut the SSS Sending wafer die from some dark gray card stock several times and stacked them up (using spray adhesive to stick them together). 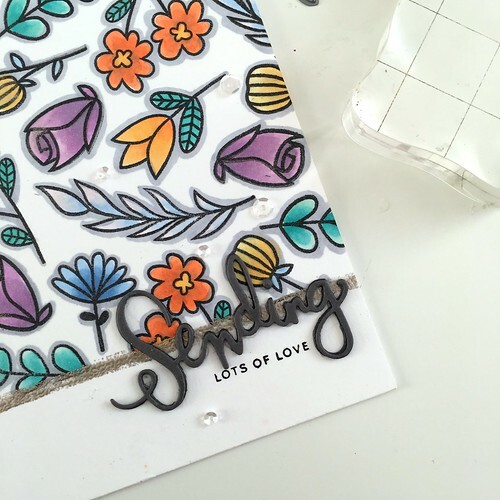 I stamped the lots of love part of the sentiment on the panel before adhering my Sending die cut just above it. I also entered this card into the current Simon Says Stamp Flickr Challenge. 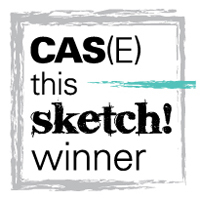 You can read more about the challenge (and enter a card!) by clicking here. I hope everyone has a wonderful weekend! 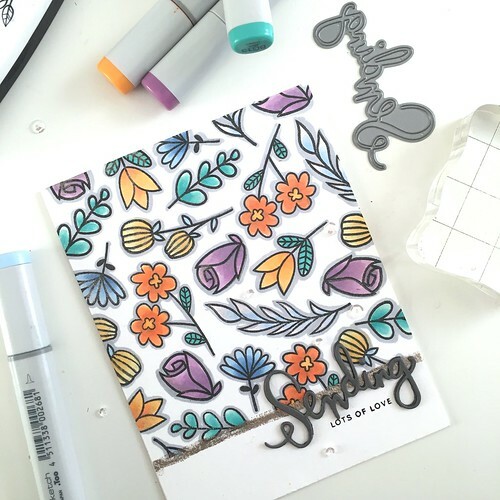 I do love a good piece of patterned paper, but I think I love being able to make custom patterned paper using lots of my own stamps even more. Case in point, this project! 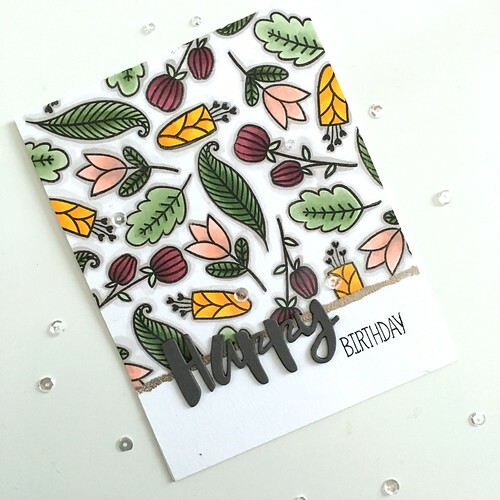 I used the Hello Sunshine stamp set from Altenew to create this (almost) one layer card. 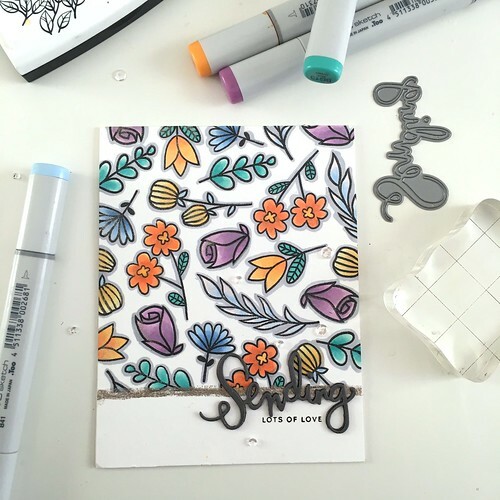 There are so many great floral images in this set and it’s hard not to want to use them all at once, so DIY patterned paper is always a good solution to be able to incorporate a lot of images at once. I started off by making off the bottom of my card to leave a bit of white space and add some interest to the card (just like I did here). I then selected several images from my stamp set and started stamping them in a pattern all over the paper using Intense Black Ink. 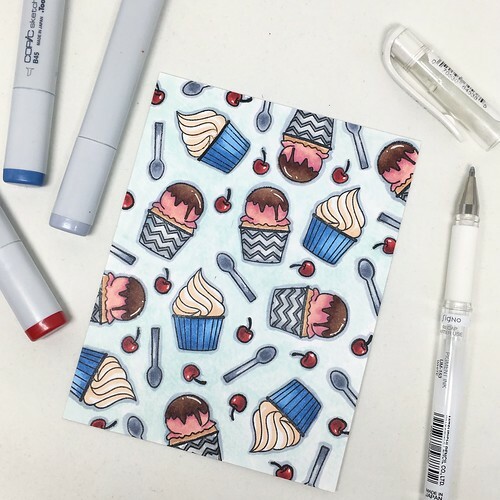 One of the keys to making your DIY patterned paper look legit is to make sure you stamp some images so that they are running off of the edges of the paper. Once everything was colored, I heat embossed a line of liquid platinum embossing powder where the pattern stamping met the white area of the card, and then used the “happy” part of my Painted Happy Birthday die for the sentiment (layering several slate gray-colored die cuts on top of each other). 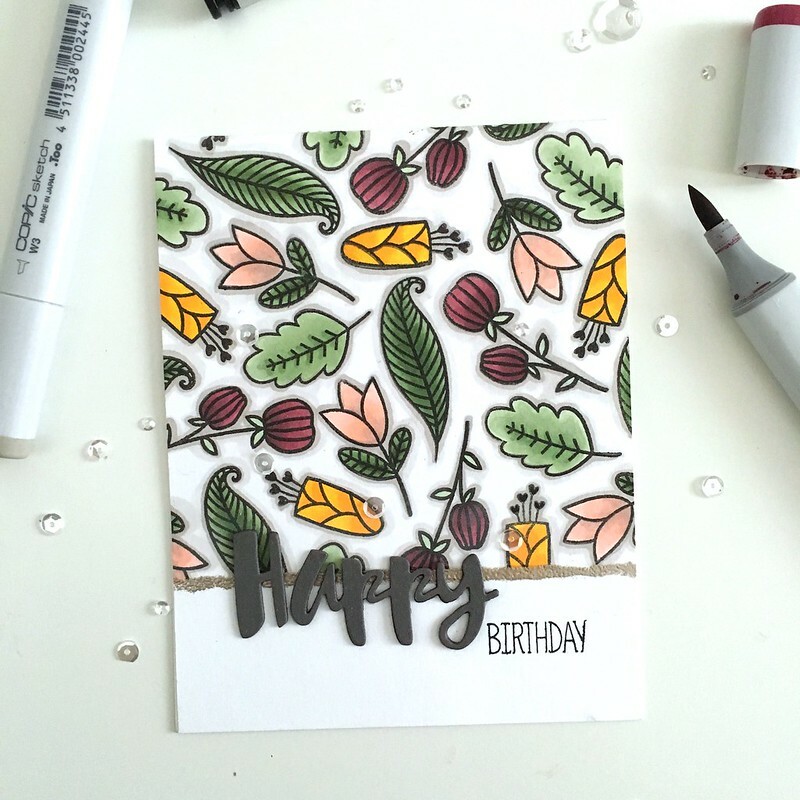 I finished by stamping the word birthday using a stamp that I pilfered from another stamp set that I can’t remember the name of at the moment! 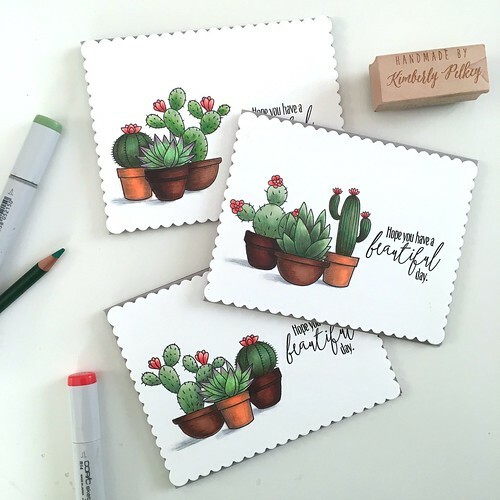 Today I’m excited to share with you a little card set I made over the weekend. Lately, I’m turning into somewhat of a plant lady. I have houseplants scattered all over my house, and I’m especially in love with succulents and air plants. 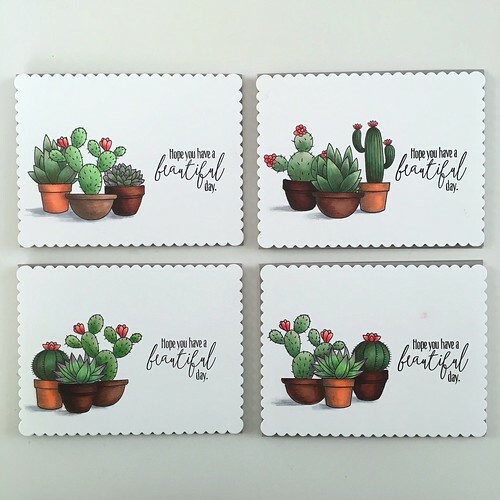 So, when I saw the LLD Sweet Succulents stamp set, I knew I wanted to make some cute cards with it. 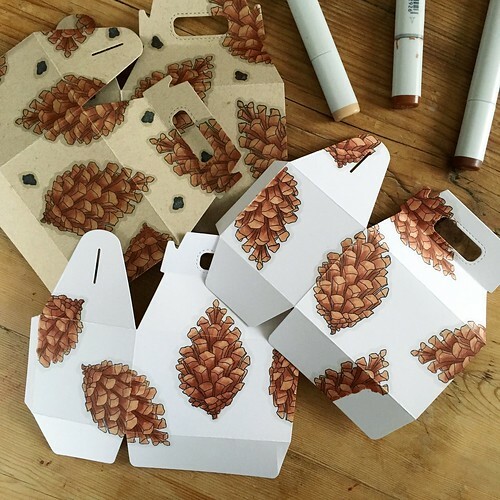 I wanted to create a cluster of potted plants on each card, so I started by making masks using my inkadinkadoo masking paper. Using masks allows you to build up a scene by first stamping whatever you want to be in the foreground (in my case, the central pot), then masking that image off, then stamping your next image (in my case, the plant that would be in the central pot), then adding a mask to that, and so on. Anything you stamp on top of a masked image will end up in the background. The best part is removing all of your masks at the end to reveal the scene! 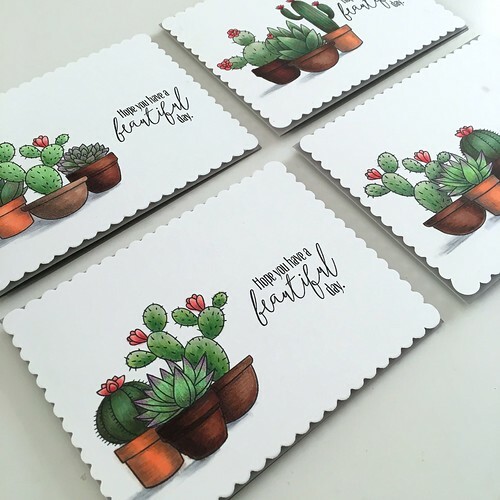 I stamped on some A2-size scallop cards that I picked up from the clearance section at Paper Source. 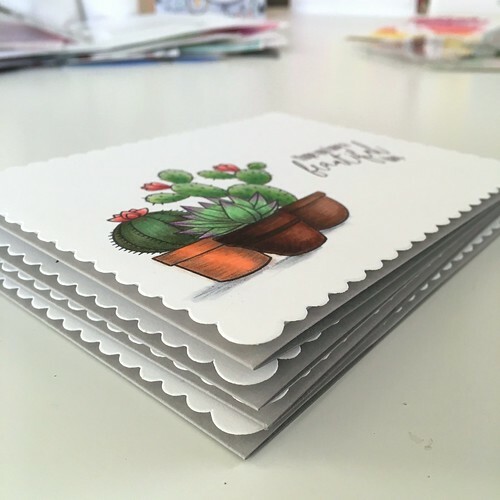 I thought the rounded edges of the paper would be a nice contrast to the visual spikey-ness of the cactus plants. I made four cards, and decided to make each scene a little bit different, so I used and re-used my masks a lot. 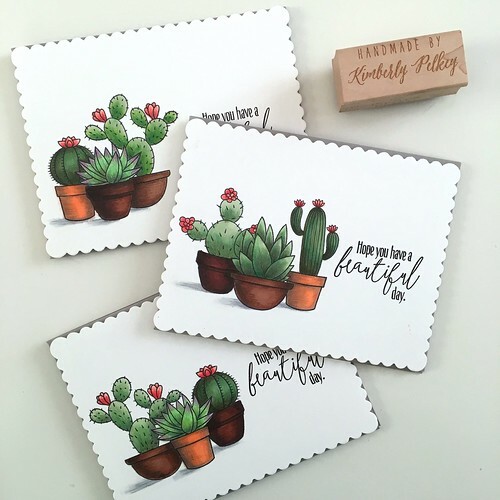 Even though the arrangement of plants differed on each card, I made sure to use the same grouping of three pots in the lower left, and stuck to the same color scheme for each card as well. 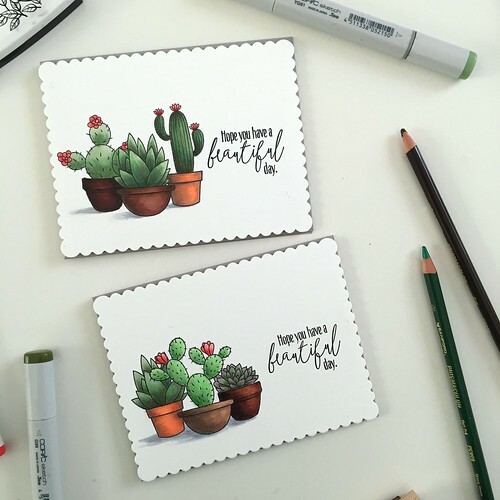 I used my copic markers to do most of my coloring on each card. You’ll notice that certain plants and certain pots retain the same color scheme across each card, which I think helps to tie everything together so that it all looks like one complete set. Doing this also kept me from having to put a lot of extra thought into my coloring. 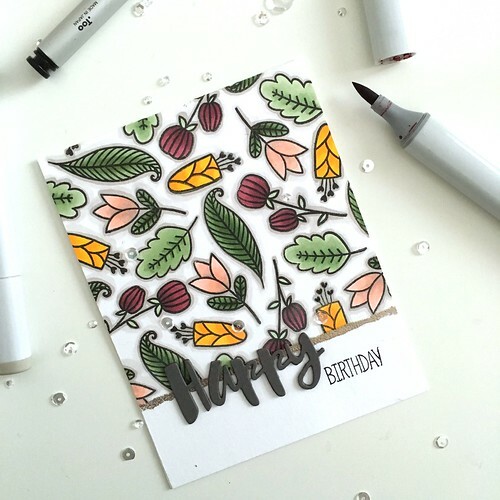 There is some variation from one to the next, but that’s the beauty of handmade cards! To finish up, I added some extra shading here and there with a few Prismacolor colored pencils. It seemed to give everything a bit of an extra pop. I also made sure to add a light shadow under each pot, to ground the images. 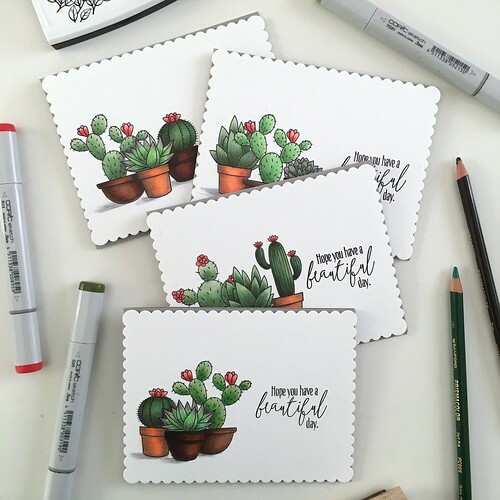 When it came time to add a sentiment, I went with “Hope you have a beautiful day” from the Doodle Buds stamp set. I thought this particular sentiment went nicely with the overall look I was going for. Once that was all set, I adhered some fun foam to the back of each scalloped panel, and then mounted all my finished panels onto card bases that I cut from some gray card stock. Voila! I hope you like these as much as I do! P.S. 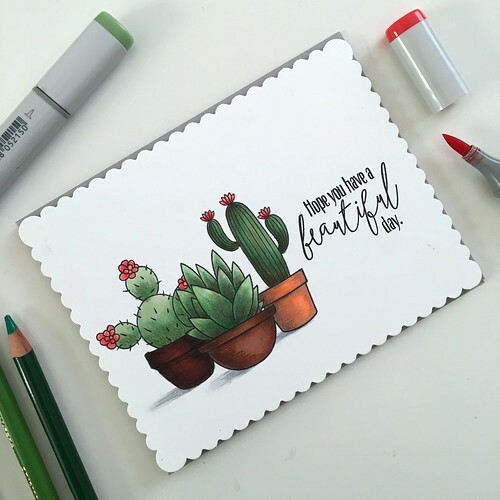 As I said before, I’m a sucker for succulents (ha!) and I’m trying to learn to identify them by name. One of my favorites are Haworthia. 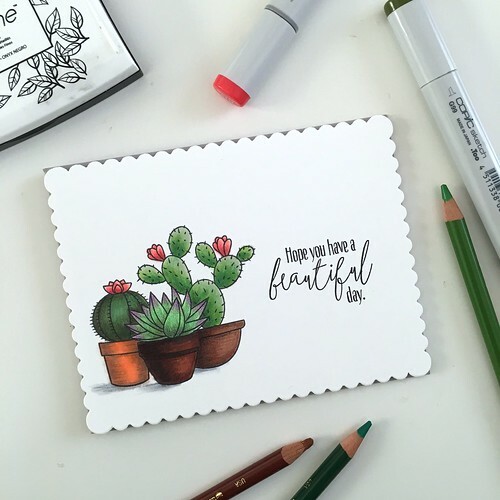 Especially good for me because they are very tolerant if I forget to water them for a day or too… :) I’d love to hear what your favorite types of succulents are! Every year I bake cookies and package them up to give to my staff as holiday gifts. Each year the packaging changes and is something handmade by me! 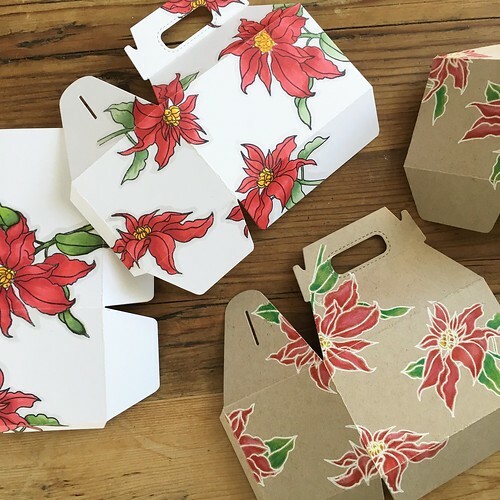 This year, I made a bunch of gift boxes to deliver the cookies in. 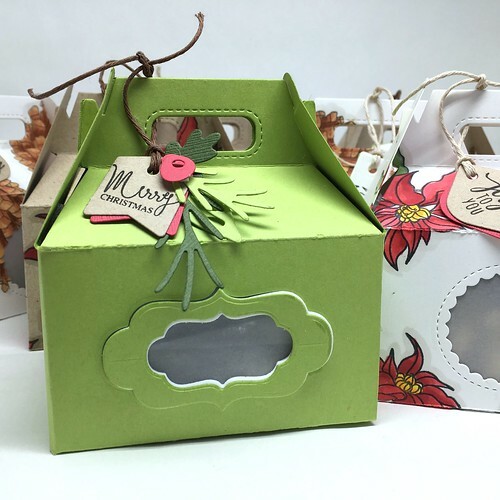 The gift box is assembled using the Mama Elephant Gable Box die and some double sided tape. Before I could assemble them, though, I had to stamp some patterns on them and color them up! 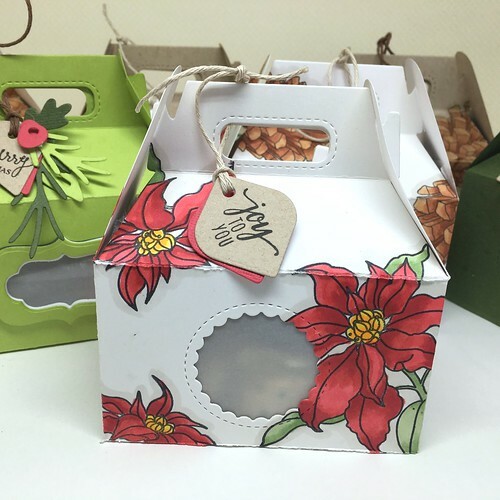 Some boxes were cut from white card stock and others from craft card stock. 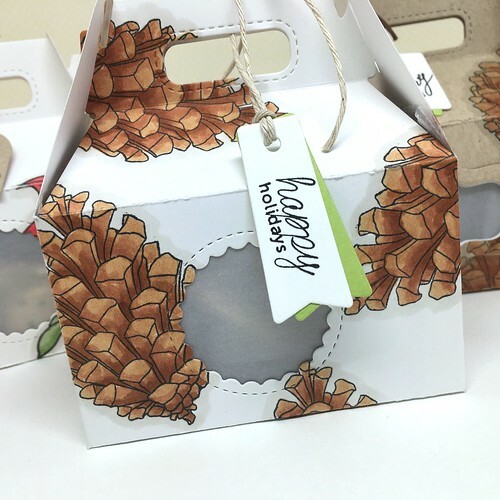 Some had poinsettias and others had pine cones. I stamped most of them with Memento Tuxedo Black ink, but others I stamped with VersaMark ink and white heat-embossed the images. I then used either copics or colored pencils to do my coloring. After I’d finished coloring all of the boxes, I cut widows in one side of them, using the same die set. Some had simple scalloped circle windows while others had a more ornate window that I gave a little dimension to by layering it on top of some fun foam. I then added some vellum behind the window. 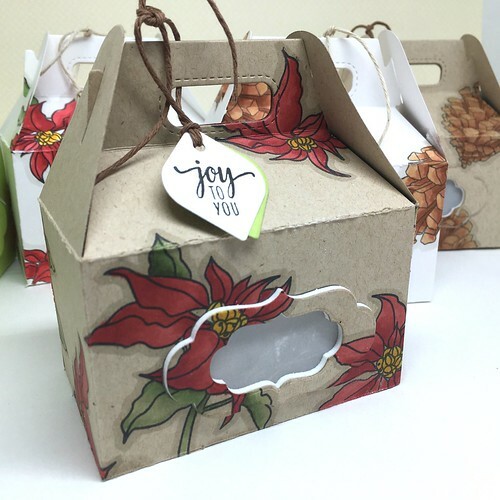 I thought about using clear acetate, but I used some Press’n Seal to line the insides of the boxes so they wouldn’t get dirty or greasy on the outside, so a clear window would have been obscured anyway. 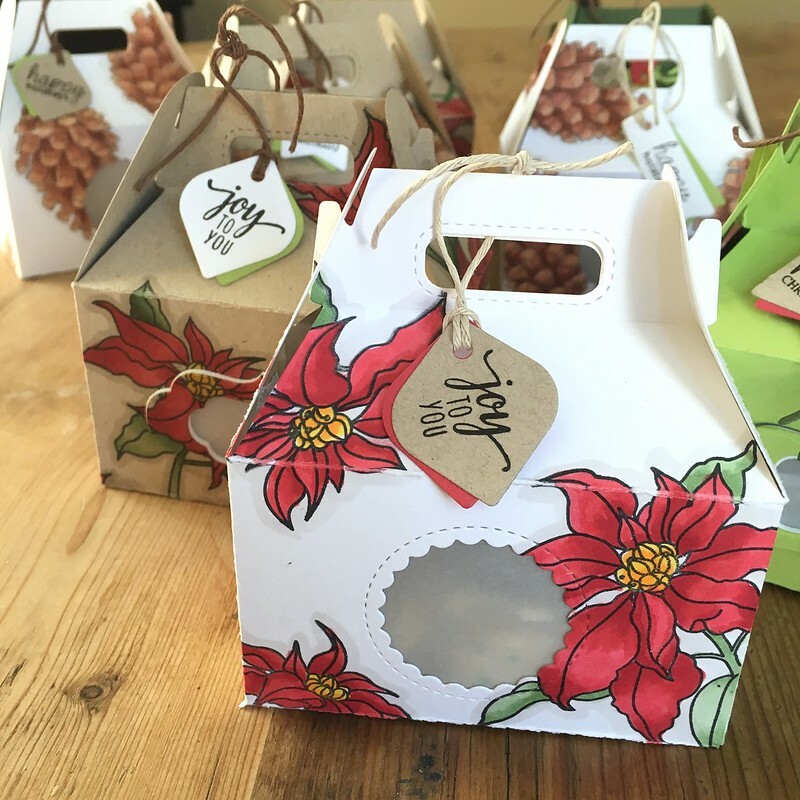 Then it was time to start adding my mini gift tags – more about those here. In addition to the stamped and colored boxes, I also made some solid color boxes, just to change it up a bit. 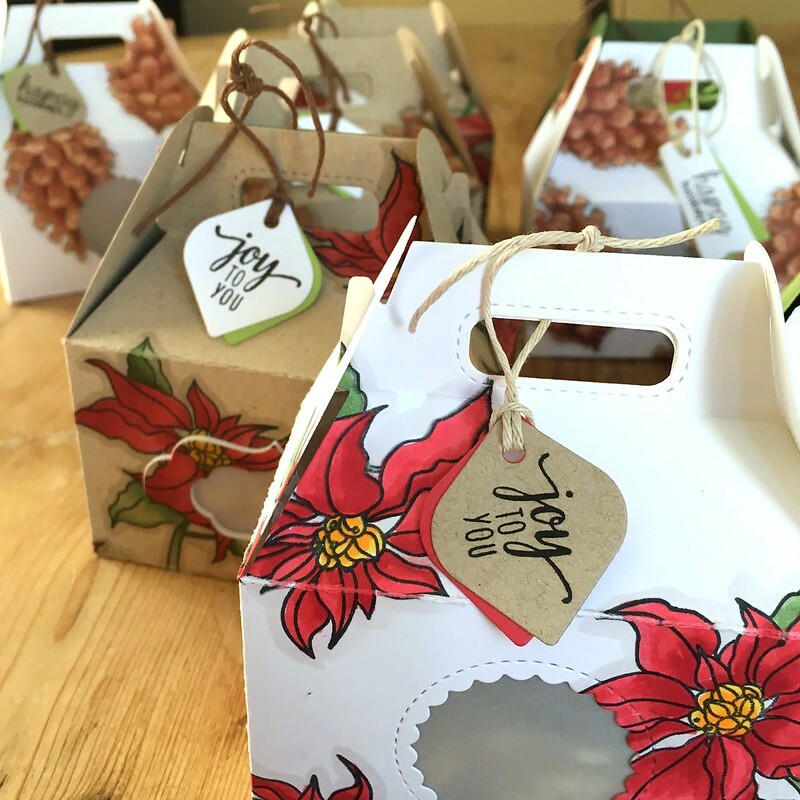 I wanted these solid boxes to be just as fancy as the others, so I added my jazzed-up mini tags onto those boxes. I managed to fit about 6-ish cookies into each of the boxes. 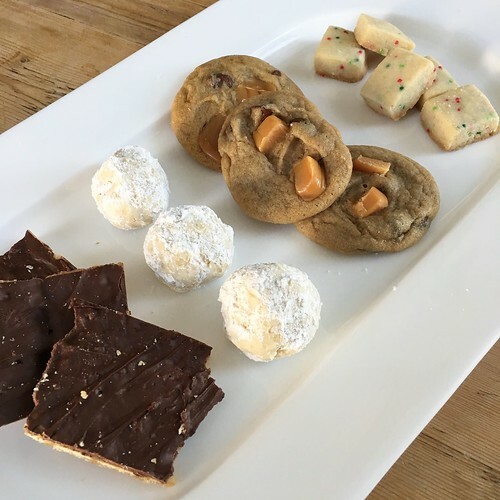 It generally went like this: One snowball, one chocolate chip, 4 holiday bites and several pieces of toffee, broken up. Sometimes I’d add an extra snowball, if there was room. I really love how they turned out, and I had a lot of fun making them! My first Christmas card of the season! 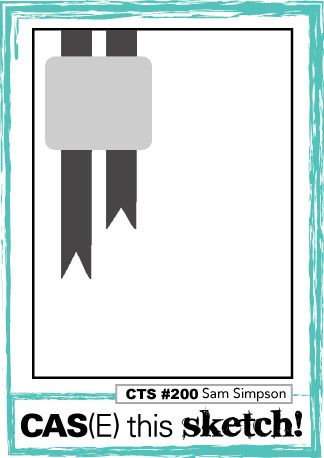 As you can tell, I flipped the sketch horizontally for my card. 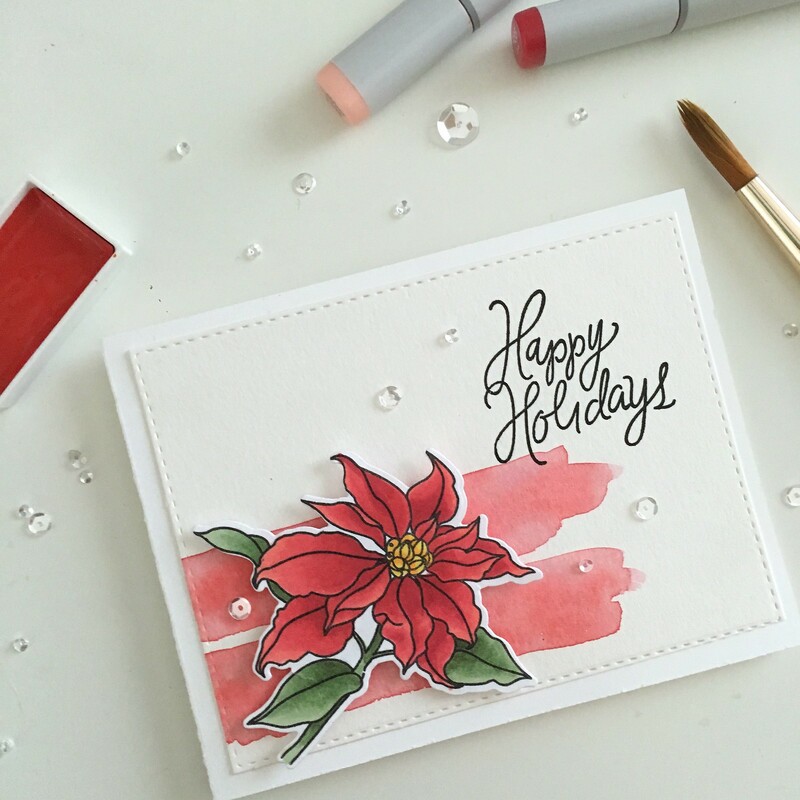 I used watercolor for the background, and painted the poinsettia with Copic markers before die-cutting it and mounting it to the front of my card with foam adhesive. 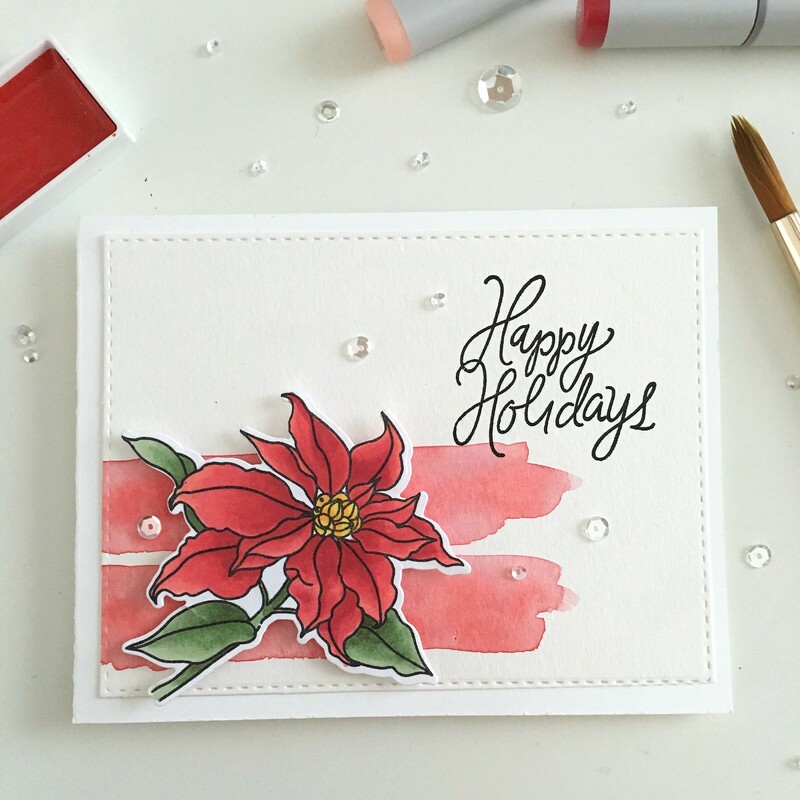 I added the Happy Holidays sentiment from a the Simon Says Stamp Gifts of Love stamp set. I stamped it with Versa Fine Onyx Black ink, which is my favorite black ink for stamping sentiments. I pulled out some Christmas decorations today, too, so I’m slowly getting into the holiday spirit! 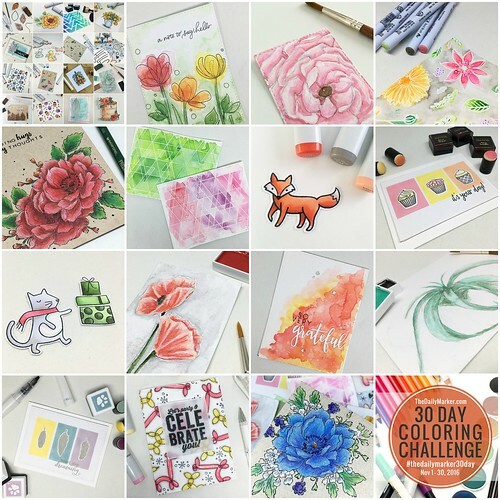 Now that the 30 day coloring challenge has come to an end, I thought I’d pop in to share a collage of the rest of my images from the second half of the challenge (you can see the first 16 images here), and a few of my favorites from the month. I started this challenge (I think this is the third one that I have actively participated in) with the goal of coloring something on Every. Single. Day. of the challenge – something I wasn’t able to do in the last few challenges. I did it! And I have to pat myself on the back for keeping up! There were several days when it seemed like life was too much in the way, but on those days I would do as little or as much as I could and tried not to get too hyper about it. Some days, when time allowed, I’d start one or two projects which would allow me to finish up the second one on another day when I felt like I had less time to color. This time around, I used copics, watercolors (my new favorites) and inks (oh, my!) and it felt good to practice a lot of different techniques. I even got myself back into some drawing of my own, which felt really good. It’s been a long time since I drew with intention – usually I’m just doodling. 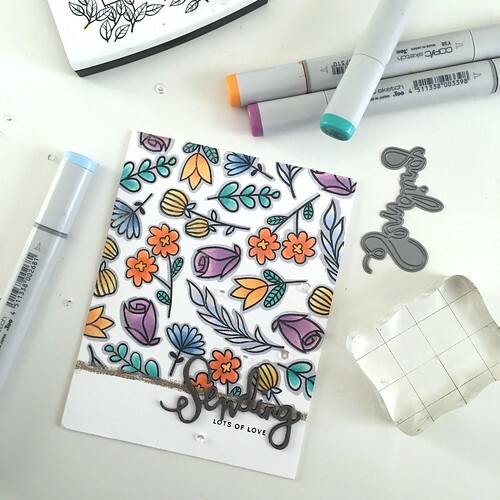 I truly believe that having a creative outlet keeps me sane and calm – especially on days when I feel anything but. I also really enjoyed sharing my images on Instagram and receiving lots of nice feedback from other card makers. 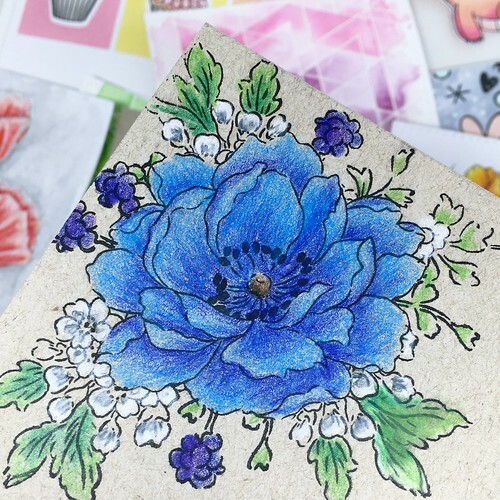 I feel like these coloring challenges do a lot to bring card makers together and allow us to share inspiration with each other. Needless to say, I’m looking forward to the next challenge! Hello and welcome to Freshwater Studio! 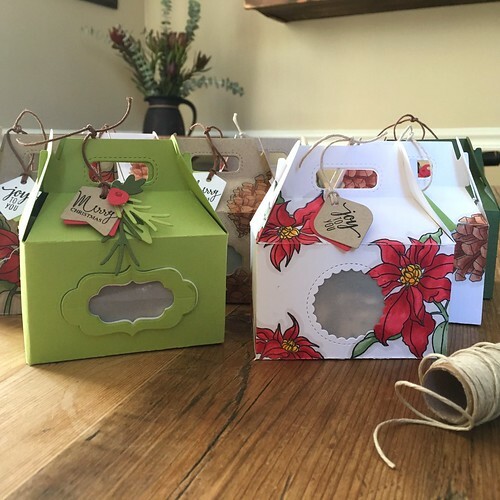 I’m Kimberly: paper crafter, soap maker and lover of all things DIY. Thanks for visiting! I hope you’ll like it here. Follow Freshwater Studio on Instagram! 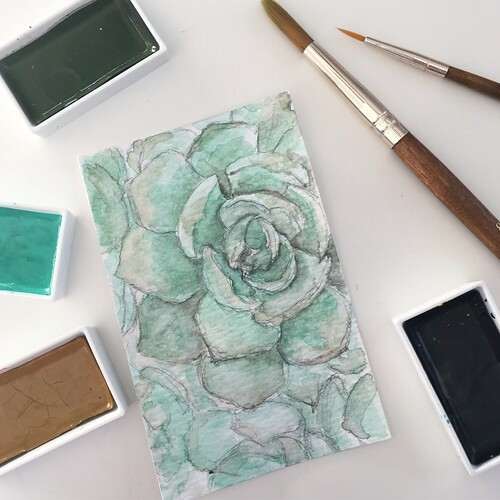 Purple Watercolor Card + a Video!